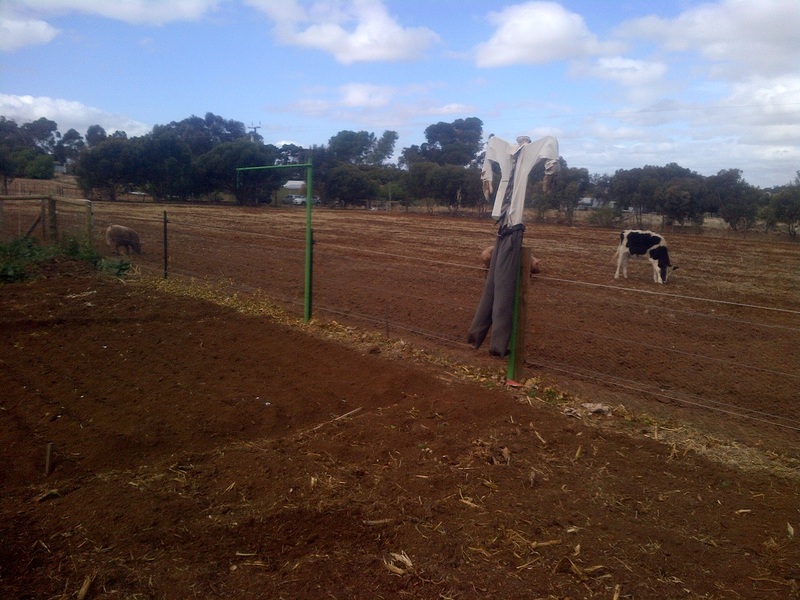 Winter Crop in The Patch – 2013. This was our first shot at planting a cool-weather crop in The Patch. Last year it wasn’t ready yet, though we had our smaller beds up near the house. This year after waiting for rain so we could rotary hoe , and after rejigging our plan, we were ready for our first Winter crop at scale. Our pumpkins in bed 1 are still going. I’d expected them to be done in February, or maybe March at the latest, but here we are in the middle of May and they’re still going strong. More than that, they’re flowering and producing small pumpkins still. We were combining our umbelliferous (carrot and parsnip) and allium (onion and garly) bed, having chenopods on their own, and had a cruciferous vegetable bed. However, I found that an entire bed for chenopods was probably overkill, while it seemed that every second vegetable I wanted to grow over Winter was a chenopod (brassica). One of the beds, which we barely used over Summer, has some sand and gravel in it. Rotating along one bed would’ve had carrots in this, which wouldn’t have worked well. We rotated everything along two beds. This means that the sandy/gravelly bed is fallow, though we put in a blend of barley/lucerne as green manure. 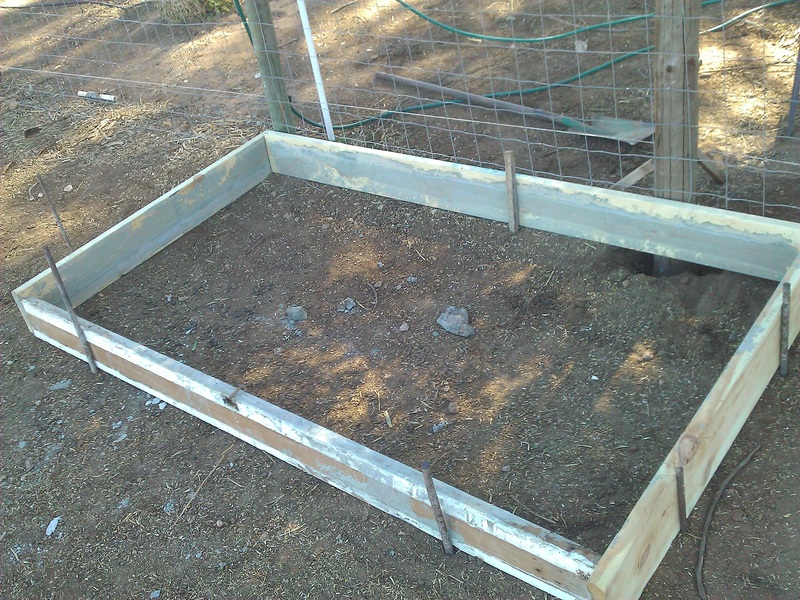 Bed 1 with the pumpkins has been left alone, and will be where we put up a shade/hot-house or a poly-tunnel. This means we’re incorporating the big bed near the house in our rotation system. I have an entire bed for alliums. This may end up giving us too many onions, but we’ll see after this season. I combined the chenopods with the carrots. This still left us space, so I have an overflow portion for brassicas. This works well with the rotation, as the crucifer bed is 3 beds away, so we’re safe to plant crucifers in this bed when it rolls around in the rotation. I planted extra legumes in the large bed near the house. We have an entire bed of legumes down in The Patch, but we have the spare space and I’m quite keen to get a lot of peas and beans frozen this season. The plan is to plant out every square inch, especially with the staple crops, and see where we end up after Winter. Last year we did well for garlic and onions, but ended up under-estimating how many we’d need by maybe a factor of 2. This year I want to grow as many of everything as we possibly can, just so we have a benchmark for following years. I’ll renumber the beds now that we’re reclaiming one for the poly-tunnel. That means we have five in The Patch (1 through 5, left to right), and bed 6 is the large bed up near the house. 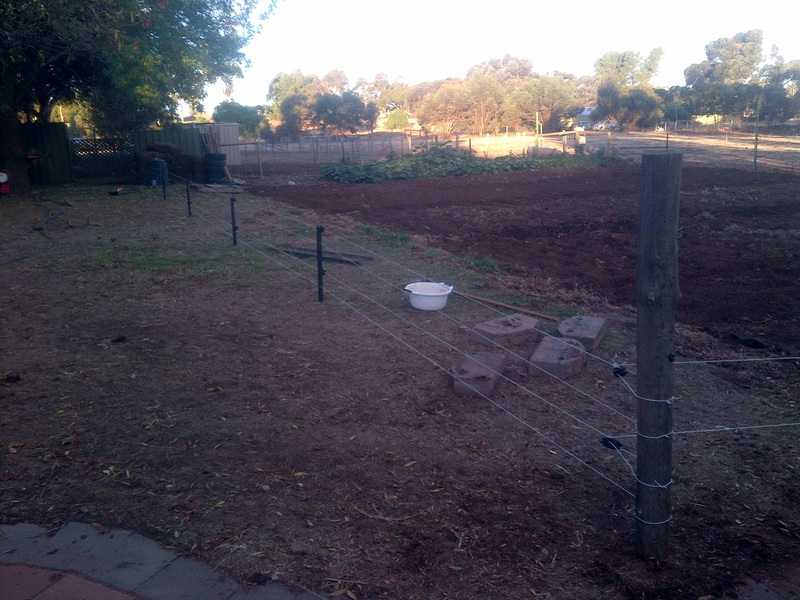 Some of bed 6 is permanent – strawberries, chillies, asparagus. We still have a heap of space to work into the rotation though. Brussel Sprouts – Drum Tight. Seedlings. 3 rows. Brussel Sprouts – Drum Tight. Seeds. 1 row. Brussel Sprouts – Evesham. Seedlings. 1 row. Brussel Sprouts – Evesham. Seeds. 1 row. Brussel Sprouts – Ruby. Seedlings. 2 rows. Brussel Sprouts – Ruby. Seeds. 1 row. Mini Cabbage. Seedlings. 1½ rows. Mini Cabbage. Seeds. ½ row. Mini Cauliflower. Seedlings. 3 rows. Pak Choi. Seeds. 2 rows. Broccoli – Romanesco. Seeds. 2 rows. Wom Bok. Seeds. 2 rows. Broccoli – Green Dragon. Seedlings. 3 rows. The cauliflower and broccoli (green dragon) were store-bought seedlings. The rest of the seedlings were grown by me in our little hot-house. I hope that by planting out both seeds and seedlings of some types at the same time, we can end up with a staggered crop. Some of this we can preserve and/or freeze, but staggering the crop is still a good idea. Springs Onions – White Lisbon. 1 row. Leeks – Mammoth. 2 rows. Onions – Evergreen Bunching. 10 rows. Onions – White Globe. 10 rows. Onions – Red Beard. 10 rows. Onions – Californian Red. 3 rows. Onions – Red Marksmen. 2 rows. Onions – Melbourne Market. 1 row. Garlic – Xian (note: cloves were a little dry and may not germinate well). 1 row. Garlic – Dynamite Purple. 3 rows. Garlic – Early Purple. 2 rows. Garlic – Japanese Red. 1 row. Garlic – White. 2 rows. We potentially have over 1000 onions here, which would obviously be overkill. I’m really very keen to grow as many as we can in the bed, however, just to see how many we can grow and how many we need to cover us. Beans – Borlotti. 1 row. Peas – Dwarf Green Feast. 4 rows. Peas – Dwarf Sugar Snap. 3 rows. Broad Beans – Crimson Flowered. 1 row. Broad Beans – Aquadulce. 2 rows. Peas – Yukomo Giant Snow Peas. 3 rows. Pea – Climbing Snow Peas. 4 rows. Peas – Green Feast. 10 rows. Carrots – Chantenay Red Core. 10 rows. Parsnips – Hollow Crown. 2 rows. Beetroot – Monorubra. Seeds. 5 rows. Beetroot – Super King. Seeds. 2 rows. Radish – Black Spanish. Seeds. 1 rows. (not a chenopod, but this is where they are in the bed). Beetroot – Derwent Globe. Seeds. 3 rows. 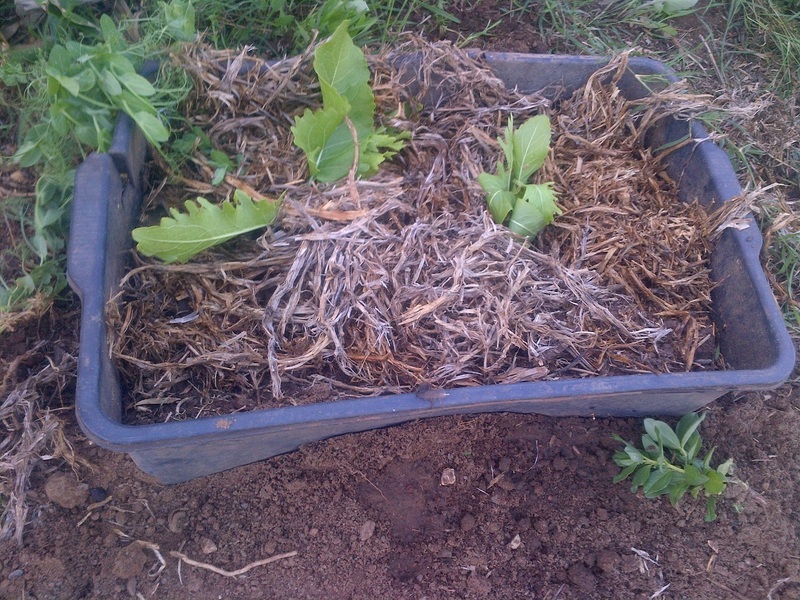 Lettuce – 2 rows with 2 for staggered planting. Seeds. (not a chenopod, but this is where they are in the bed). Spinach – Baby Leaf. Seeds. 1 row. Spinach – Perpetual Leaf. Seeds. 3 rows. Spinach – Lazio F1. Seeds. 4 rows. Silver Beet. Seeds. 1 row. Silver Beet. Seedlings. 2 rows. Mustard Greens – Miike Green Giant. Seeds. 2 rows. Mustard Greens – Wasabi. Seeds. 2 rows. Fallow. I bought lucerne as a green manure, and padded it out with some extra barley we had left. This is the large bed up near the house, and I filled it in as best I could around the stuff already there. All of these seeds were our own stock from last year. We also planted asparagus and horse radish here. It already had turnips, swedes, and carrots. This bed also has our strawberries and 9 or 10 chilli plants. Just found the first con of the new easy-turn taps that we’ve installed all over the property. The smallest cow has discovered that, while in the pig runs, he can lean over the fence and turn the tap on with his tongue. As a result, there is now a small river running through the pig runs and the cows are banished. Valet: And would you like your car washed this week Mr. Atherton? Me: Do they polish it? Valet: Yes sir, we can organise that. Does it need some special attention? Me: Yes, actually. I have these large marks on both front doors. One of my cows rubbed his horns on them. Valet: <awkward silence> Why would a cow do that? Me: They’re intensely curious creatures. Fortunately, they’re also pretty damned tasty. Valet: <awkward silence> Well, have a good trip. 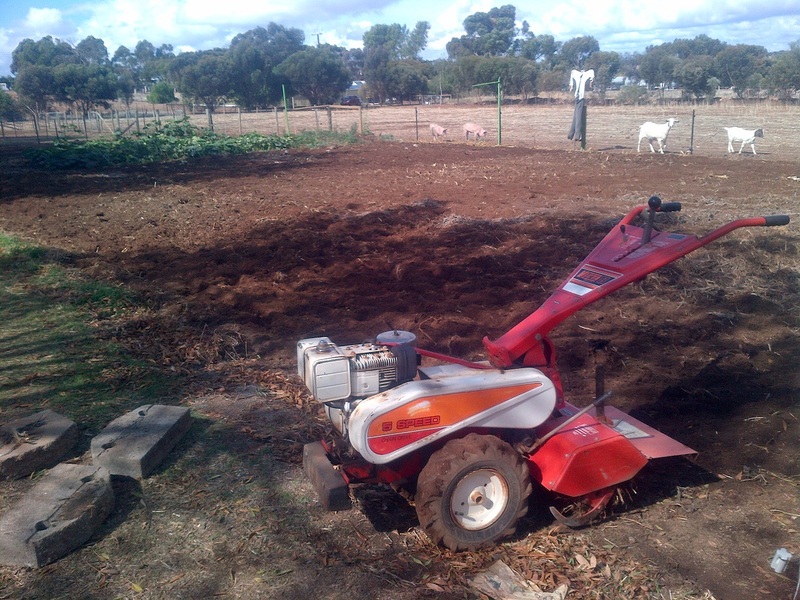 Used our amazing giant rotary hoe to turn over a few hundred square metres of veggie patch, and reclaimed about 50 square metres of the lawn. My conquest of the lawn has begun, and I fully plan on having it all productively planted within 5 years. Don’t tell Linhda. Also manage to get our fallow bed planted out with green manure, and get the rest of the beds mapped out. It’s amazing what a huge difference a year makes to the soil condition. A year ago it was dead, red clay. Now it looks like rich, dark loam. The planting begins this weekend. The plan is set, the seeds are bought/dried. So, so, so looking forward to getting it all planted out. Seriously considering a milking cow. I think I’ve found a smaller breed that doesn’t need twice daily, or really even daily, milking. It’s still a lot of work, but on the plus side we have cheese. Cheese > work. It’s basic math really. 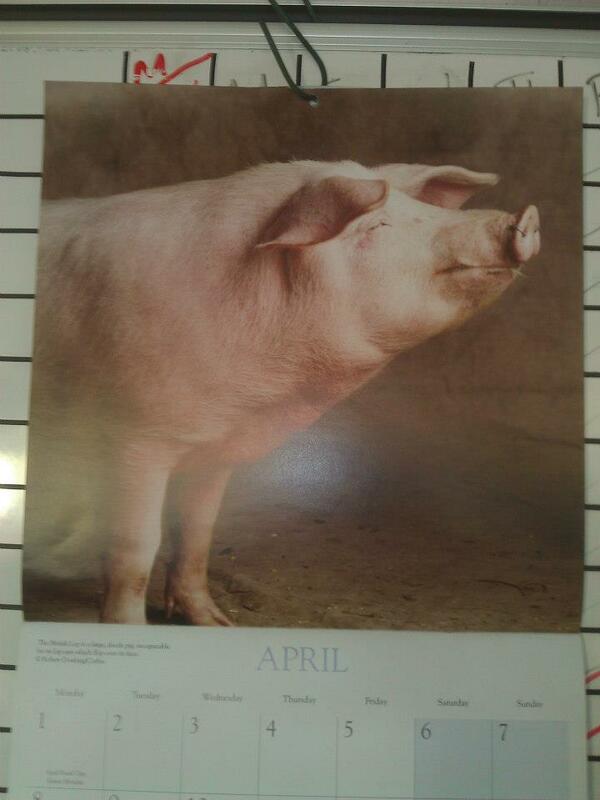 Miss April. It’s really just another shot of Miss March, but she’s still hot! After a ridiculously hot January and February , and a barely cooler March , we had been promised rain in April. In fact, for about six weeks in a row we had forecasts of rain. It seemed on the Monday we’d have a forecast of a good chance of a good amount of rain the next weekend. By the Thursday or Friday that invariably changed to little chance of next-to-no rain. It was killing me. We had most of The Patch harvested and ready for the next planting, but I needed the rain to get it rotary hoed and ready. We started the month by finishing our bacon. We put it down at the end of March, trying one cure with sugar and one with maple syrup. 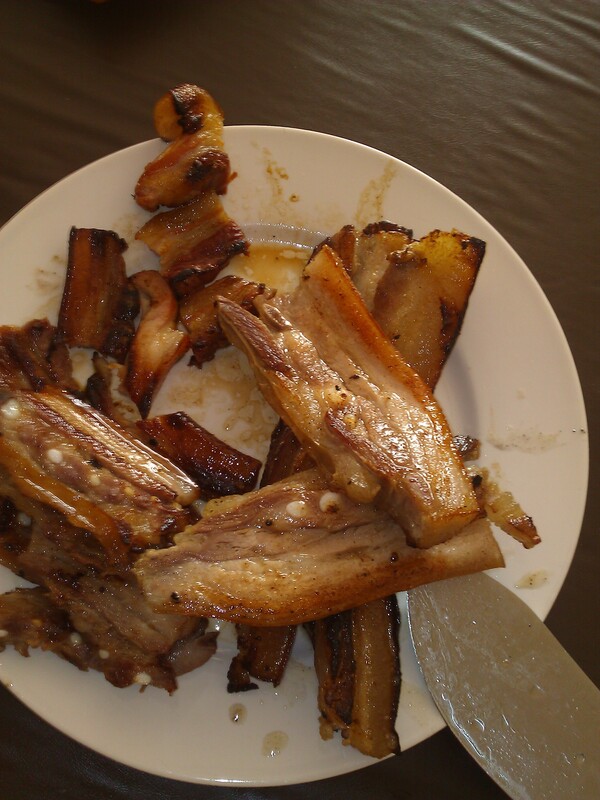 The recipe recommended seven days in the cure, but we tried some after only 3 days. 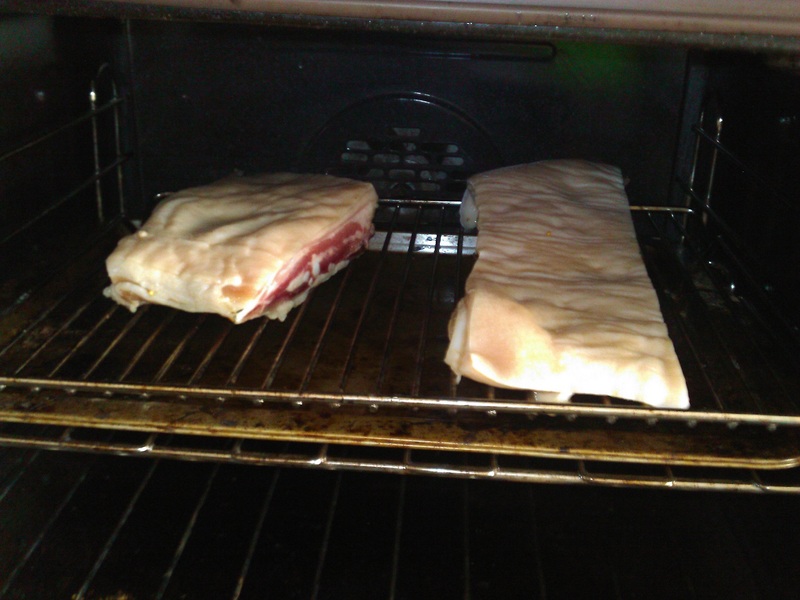 We tried two ways to finish it – one in a low oven and the other in our new home-made smoker. That gave us four permutations – two cures and two methods. Two different cures after three days. 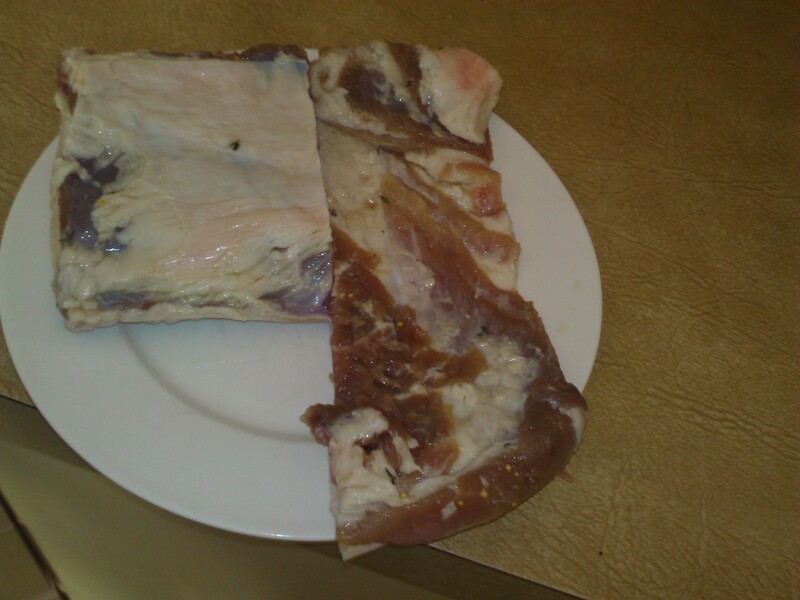 The meat is really quite stiff and glassy. Two different cures finished off in the oven. Two different cures in the smoker. We didn’t use any nitrates, opting instead to use celery juice which apparently has naturally occurring nitrates. This helps keep the colour. 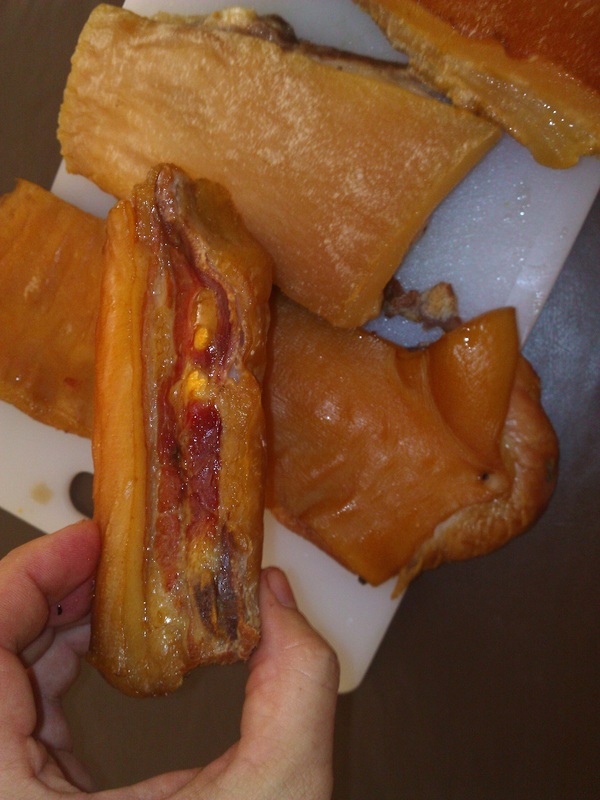 We found that the oven-finished bacon had more of a roast pork colour, while the smoked bacon had more of that expected bacon pinkness. The smoked stuff. The colour and aroma are outstanding! 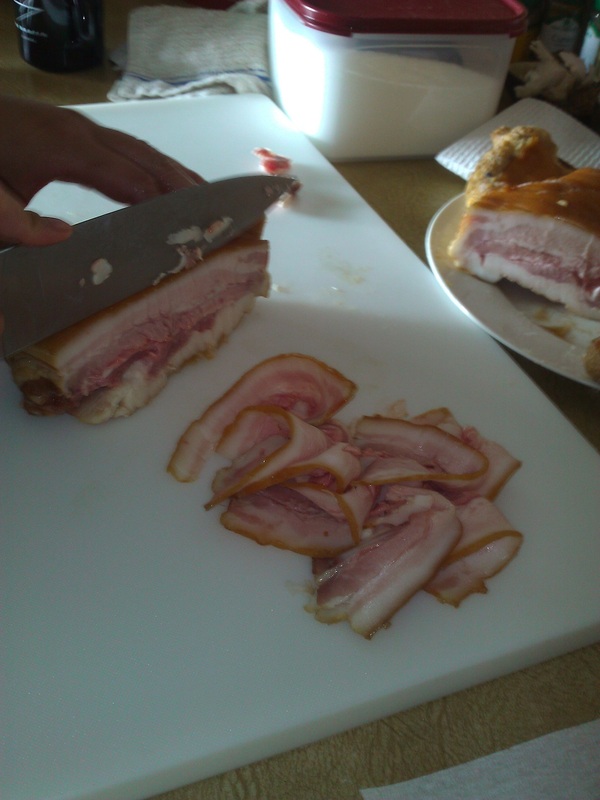 It’s hard to describe the freshness of home-made bacon. The quality has to be sampled first-hand. This was slightly under-done, meaning I’d not eat it raw. 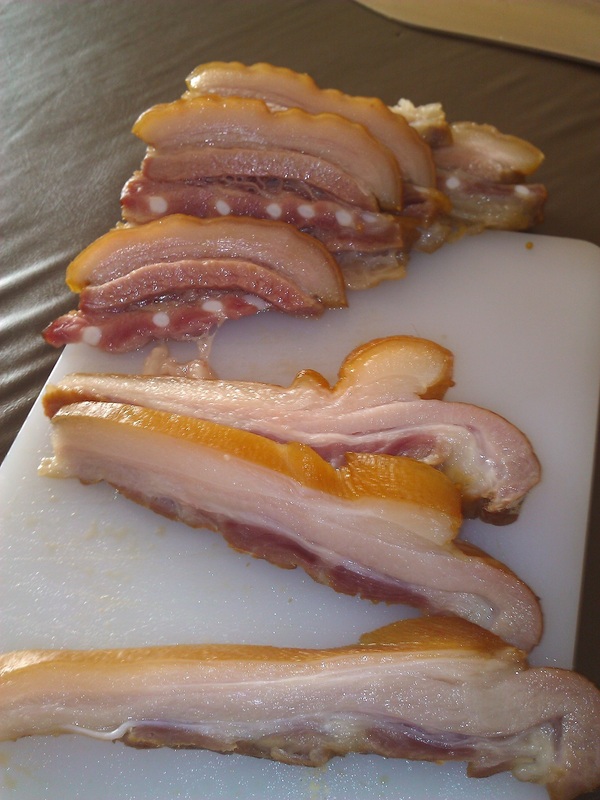 This bacon is amazing though. Both tasted great, but we preferred the maple bacon and the smoked finish. Cooked up and ready for the taste test. This not only showed us which cure and finish worked best, but also the timeframe. Three days in the cure left it almost too salty. I ended up taking the rest of the bacon and soaking it in fresh water for an hour, before finishing it all in the smoker. Next time we’ll go maybe only two days. 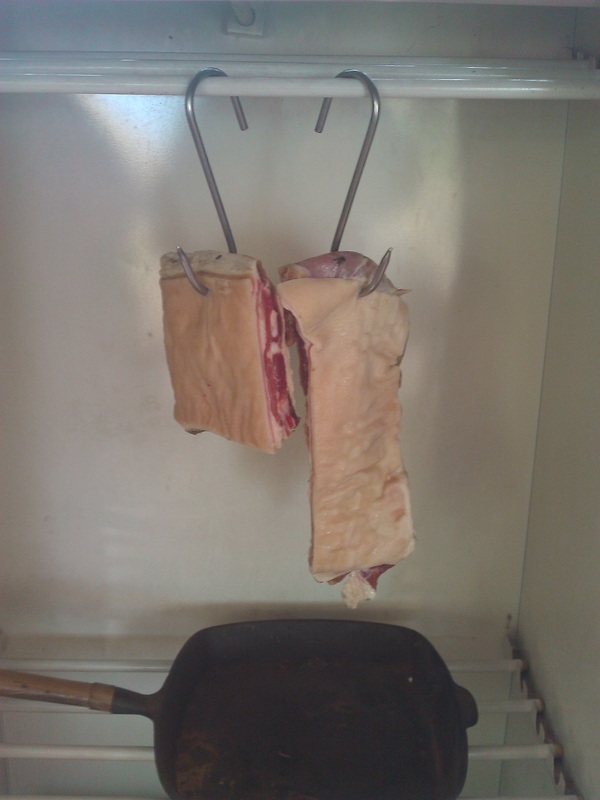 Keeping to the porky theme, we also finished and hung our first prosciutto. 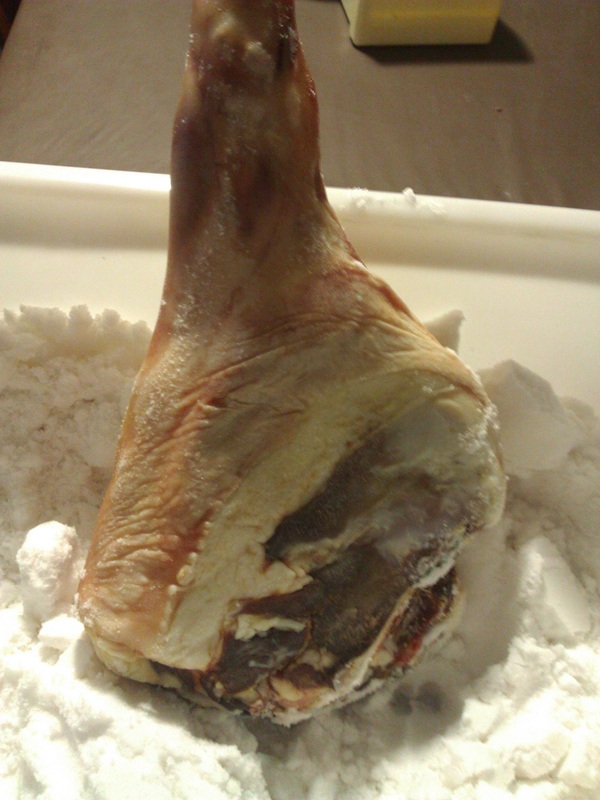 Our home-grown and home-made prosciutto. Very much an experiment. It cured for 17 days. We rinsed it, covered it in a pillow case, and hung it under the veranda. My concern is the temperature. This time of year we still get the occasional high 20’s day. I’ll probably bring it in or put it in the fridge those days. Charcuterie hanging outside in South Australia is still something I’m not at all sure is possible, and something that requires much more investigation. 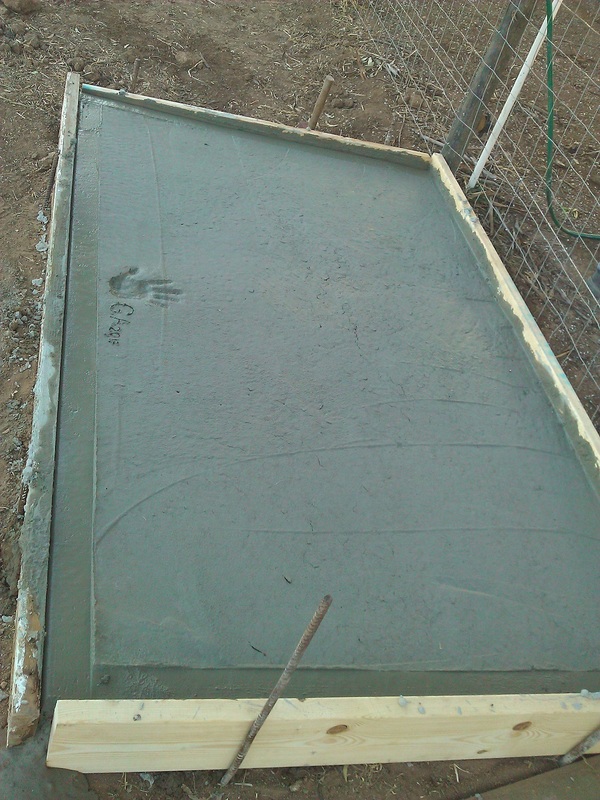 We also managed to mix and pour cement pads for two of the remaining pig runs. We’re getting much better and faster at the cement thing. Starting to fill it up. 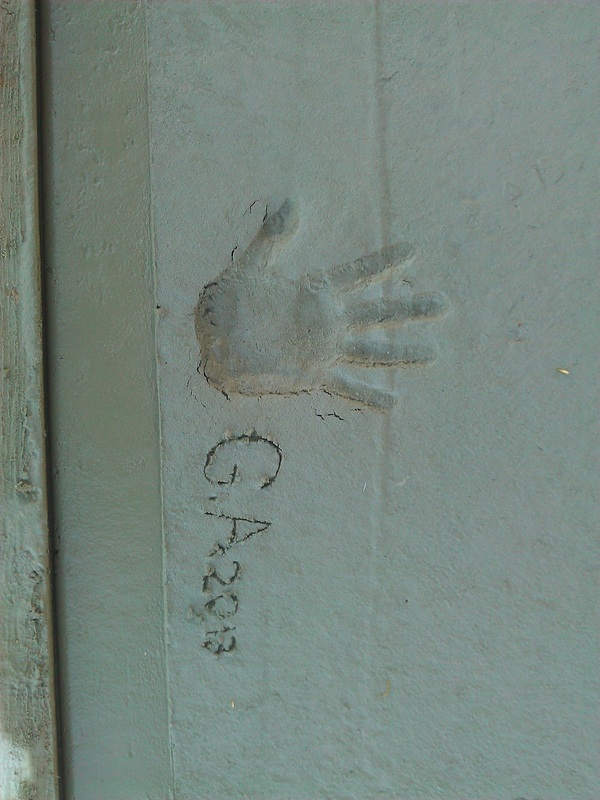 Gemma didn’t really help, but wanted to commemorate this with a hand print. We’ve not had a heap of problems with rodents, but they’re still around. This is the country and we do live in the cereal belt after all. We’ve had maybe two mice in the house, though I do have traps down in the sheds that will sometimes catch a few a weekend. I’d noted mice in both the duck and chook runs though, and we’ve managed to get a rat. With that in mind, I got some live-capture traps to clean up any rodents that might be running around. 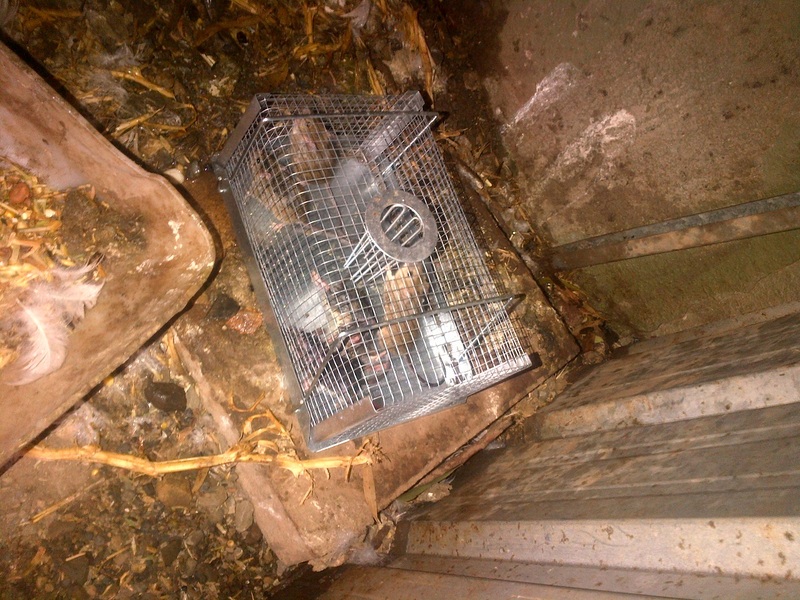 I put a live-capture mouse trap in the duck run, and caught five in the first night. This live-capture trap works amazingly well. Since then we’ve managed to get a good twenty or so. The interesting thing is that we’ll go a few days with nothing and then get a heap. They’re mostly young ones, with a couple of adults. It’s like we get some new litters that come out in a wave. In terms of meat, we had a bit of a self-sufficiency win. To me, self-sufficiency is doing it yourself. I can be a bit stubborn about that, and I get fixated on doing/raising things ourselves. However, I’ve been trying to expand that concept. An equally valid version is raising meat/veggies/fruit, selling the excess, and using that money to buy what we need. 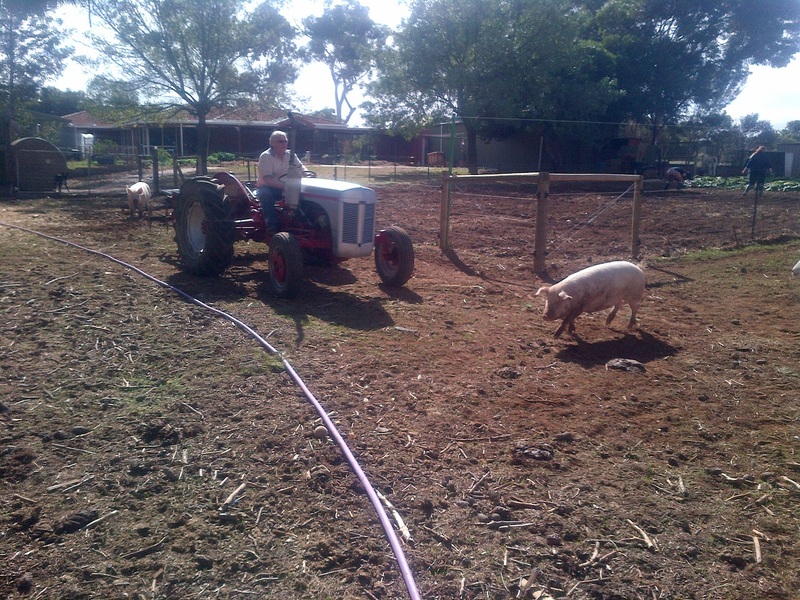 For example, I can never grow all of the food the stock needs, not on our few acres, but I can grow enough pigs to cover the cost of the feed. With that in mind, we had a sheep that was excess to our needs and so sold him on. 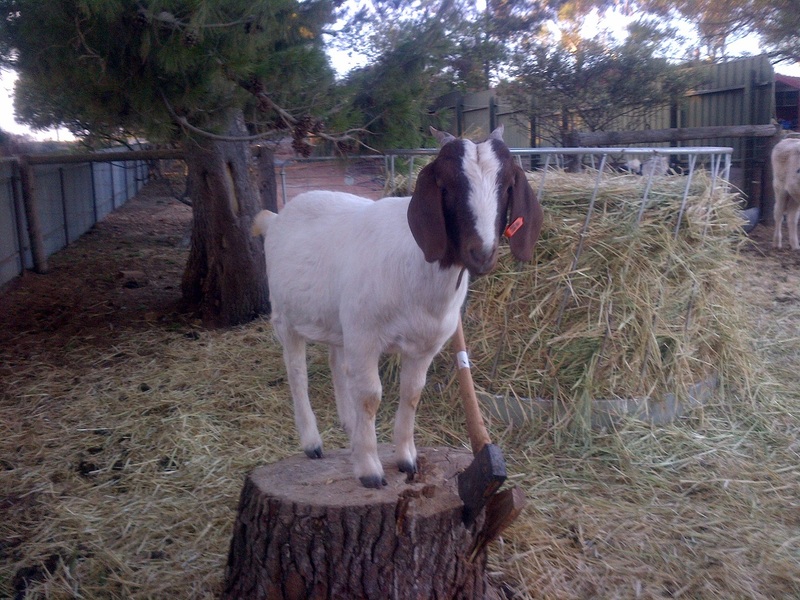 We had him processed by Menzel’s, and sold the professionally butchered meat to a friend. 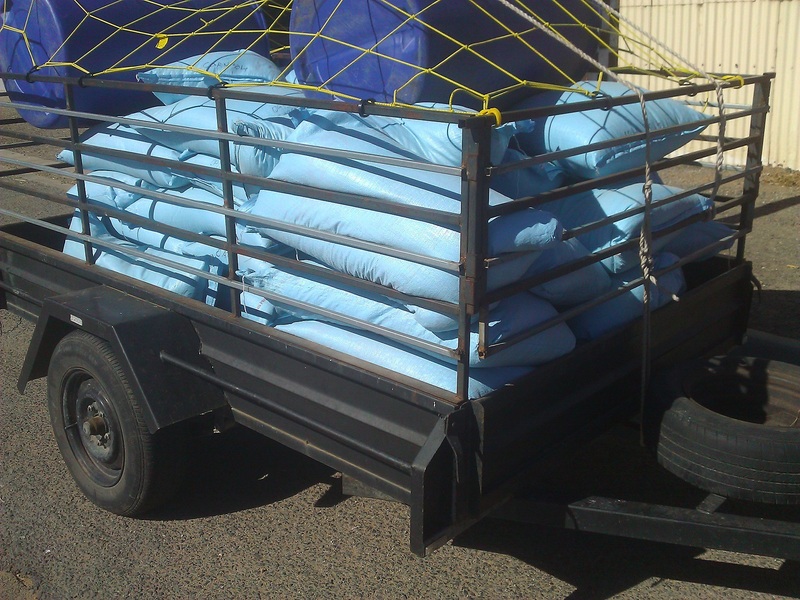 This didn’t make us a fortune, but it did pay for a half-tonne of food. Our friend got great meat pretty cheap, and we covered some stock food. It’s a small step in shifting my stubborn paradigm, but it’s significant. This is a tonne of Cow-Pig-Goat food. I predict we’ll be getting a load like this every 10 weeks. Expecting rain, and eventually begging for it, I started to prepare The Patch. I spread all of the compost from our bays over the beds. 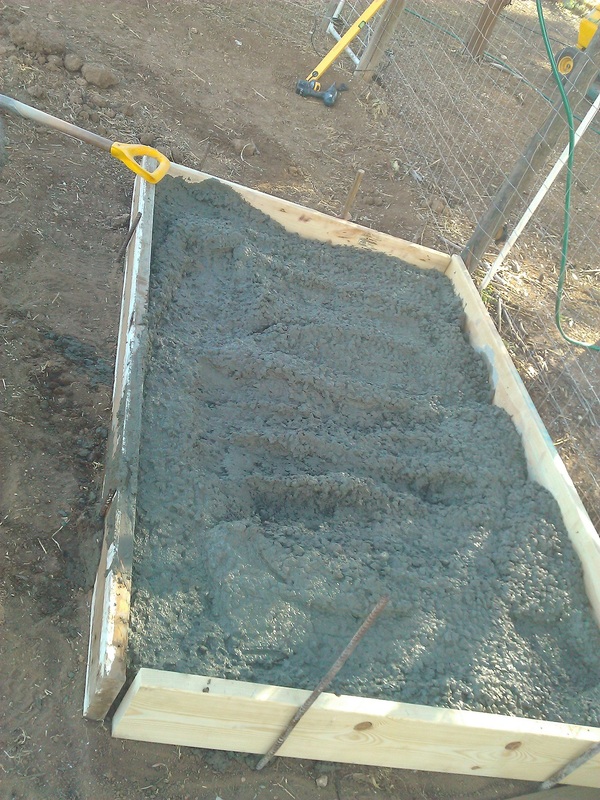 I also used Sheldon to dump maybe 2 tonnes of our remaining chicken poop over the fence. Bruce likes to supervise… from a distance. The trick is timing it so the waves of chicken-poop-dust don’t cover you. I didn’t really get that trick, and got covered. A lot. I also changed the plan a little. Rather than shuffle everything along one bed in the rotation, I’ll be moving everything two beds. The end bed, which was bed 6 this year, has the worst soil. It actually had some gravel, and is really quite thin and gutless. This year this will be green manure, as it needs the conditioning the most. 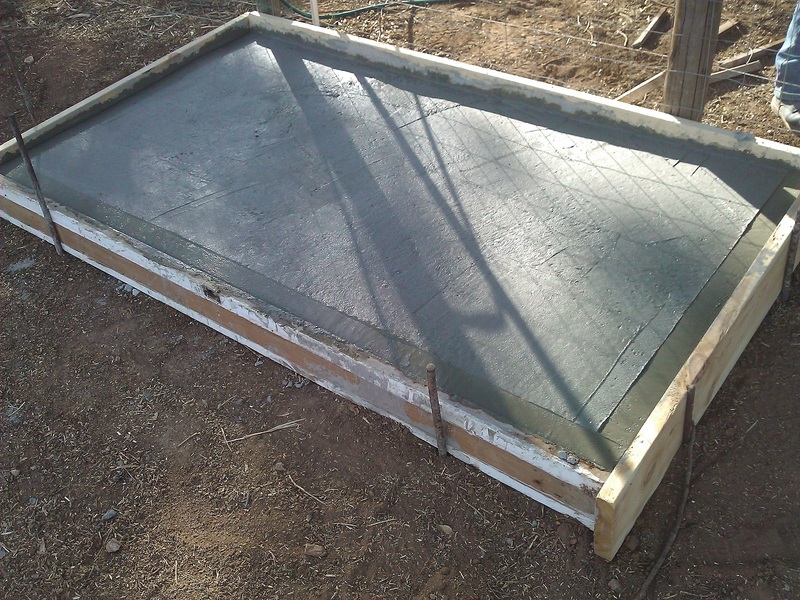 This also leaves bed 1 free for a poly-tunnel or shade house. We’ll incorporate the largest backyard patch in the rotation instead, retaining our six bed rotation system. We ended up with about an inch of rain over the third weekend of the month, but right at the end and into the Monday, meaning we couldn’t hoe The Patch. Rather, we waited until the Anzac Day holiday the following Thursday, and it turned out perfectly. 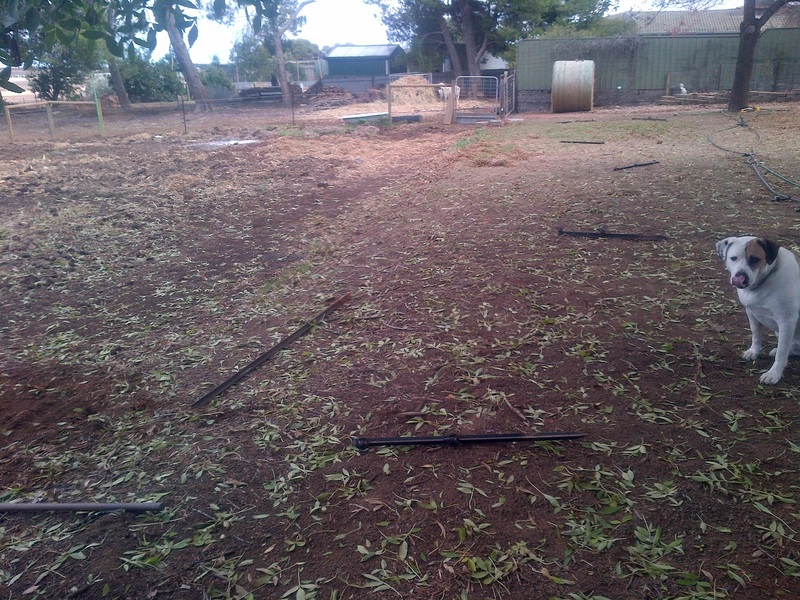 The old fence is down, ready to be moved back a couple of metres. Operation “Reclaim The Lawn” has begun. We had been worried about the rotary hoe and The Patch. 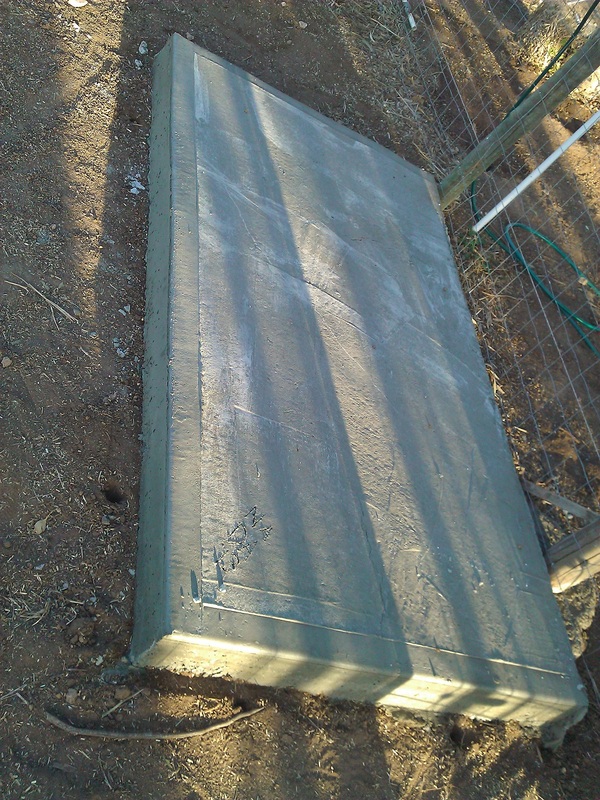 The soil was quite heavy, to the point where we had one bed that we’d barely used because we’d simply not been able to turn it over. However, the hoe went through it brilliantly. I set it at maximum depth and it was like a hot knife through butter. It wasn’t always easy, and it took some wrestling at times, but the results were spot-on. 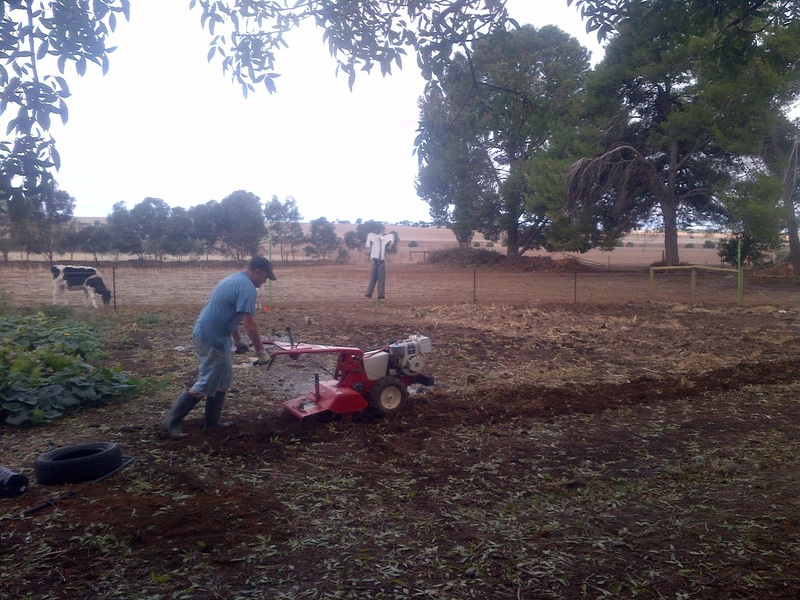 This is me rotary hoeing The Patch. This is me struggling to hold back the rotary hoe on a hard bit on The Patch. This is The Patch all hoed. That rotary hoe is a freaking beast! 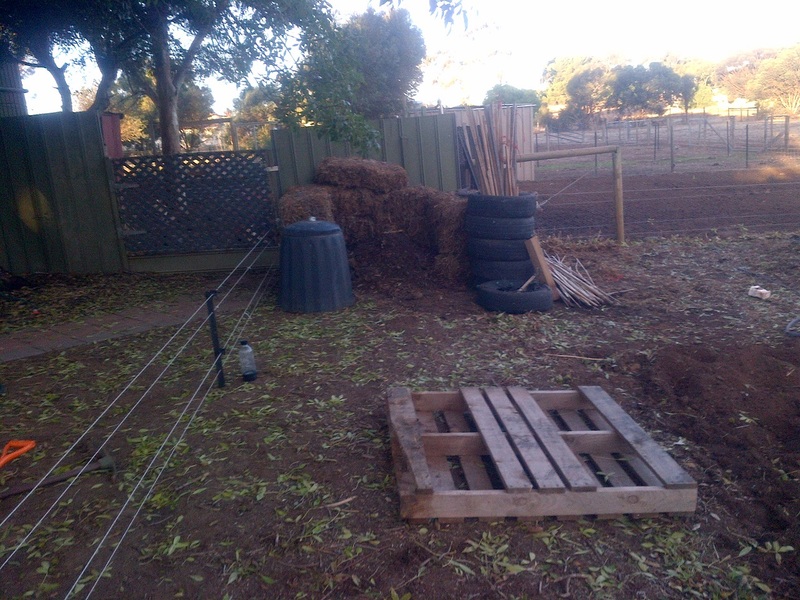 I also moved the compost bays and we put a gate at one end to give us vehicular access. Went down to one compost bay and moved it up onto the reclaimed area. With the poultry and the babies, we really don’t need a multi-bay compost system. A gate to allow us to get vehicles (e.g. the ride-on and trailer, or Sheldon) into The Patch. I mapped out the beds by digging a small path between them. The first time I did that it was quite easy as there really wasn’t much depth to the soil. This time was significantly harder, as the soil was much deeper. I planted green manure in the RHS most bed (bed 6). This was a mix of Lucerne I bought specifically as green manure, and some barely we had left over from the pig’s food. We’ll let this get to maybe thigh-height before cutting it down and turning it in. We ended up using the same mix in the three empty pig runs too. At the same time, dad broadcast some old lawn seed I had sitting in the shed, just to use it up. The runs were all quite green after the rain, just from the grain the goats and pigs had spread around. Add this extra seed to it and it’ll hopefully thicken right up. We’ll wait until it’s a decent length and swap the pigs in. This keeps the runs fresh and gives the babies green feed. All of those legumes came from seed we’d kept from last year. 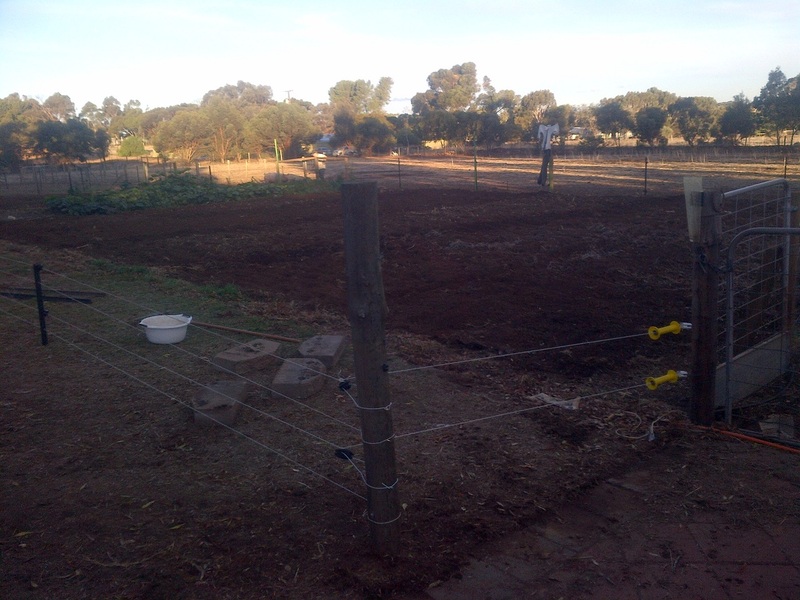 We also planted the allium (onion/garlic) and legume (pea/bean) beds in The Patch. This year my aim is to use every spare square inch to grow as much as possible, especially of the staples. I need a benchmark to see how much we need to grow from year-to-year. I thought we did quite well for garlic and onions last year, but we ended up being out by probably a factor of 2. 7 different kinds of garlic. We bought a heap from The Diggers Club to test out and see which we like the most. We planted out nearly 200 in total. Red, bunching, and white onions. We planted out 34 x 4m rows. That’s probably somewhere between 1200 and 1300 onions. The legume patch has a huge variety of beans and peas. Again, we bought a heap of different varieties to try and see which we like most. We also got some other various plants – herbs, berries, etc. Most of these won’t be planted until May after some more rain. However, I did manage to get horseradish! I’ve been after horseradish for a while, and am pretty freaking excited! I cut the bottom out of a busted old tub to contain it, as apparently horseradish has a tendency to get away from you if you’re not careful. 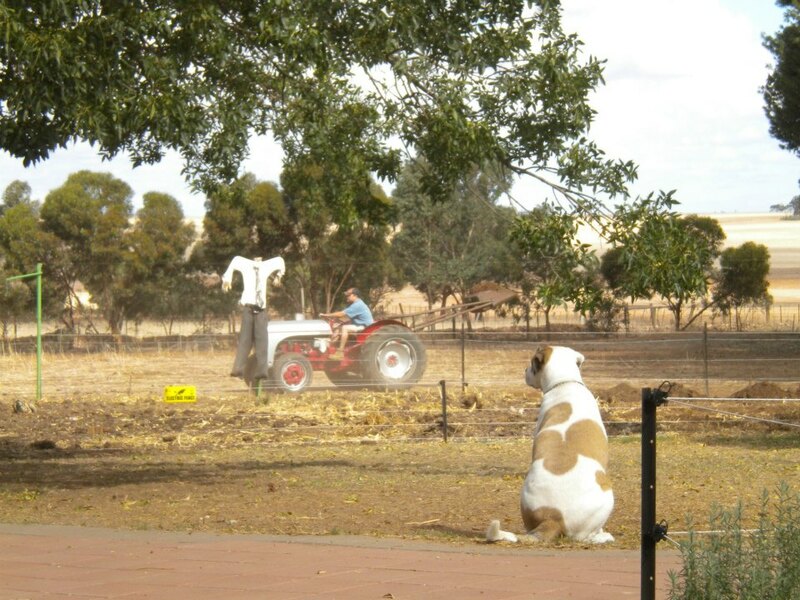 The last thing to happen in April was dad ploughed the back paddock. We’re probably still a couple of weeks from sowing, but Farmer John next door suggested we turn it over now after the rain. 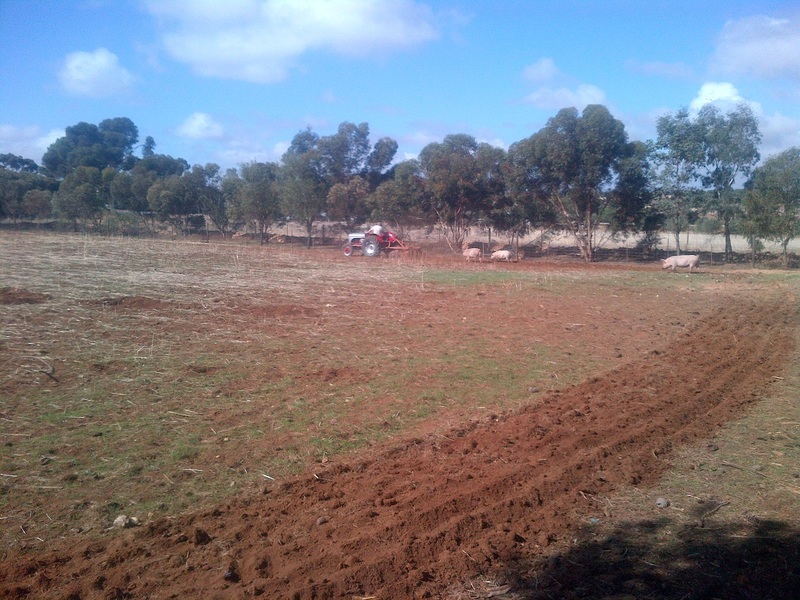 Within a couple of days there was more greenery coming up, and the cows and goats love it. 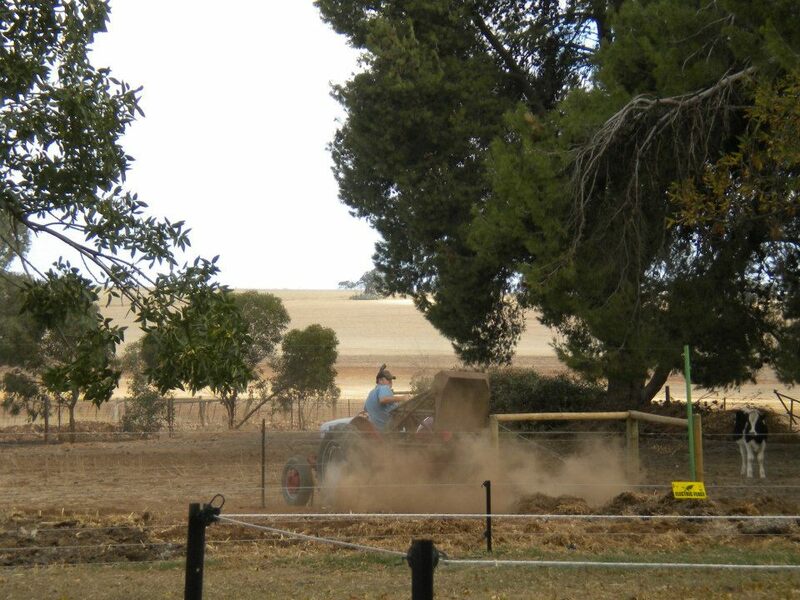 Dad getting ready to plough. 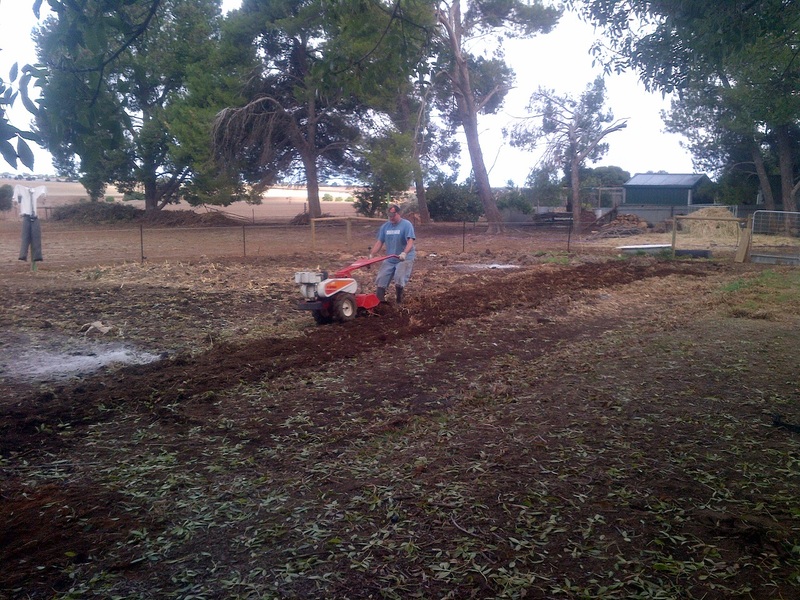 For some reason, the babies thought that dad ploughing was a game. They spent the entire time chasing the tractor or messing with the cows. It was better than watching TV. It was weird having so much of our veggie area idle for so long. I’d always expected to work up a routine where we pretty much knew exactly what we’d be doing from month-to-month and could plan ahead. Instead, I expect that we’ll be playing much of it by ear. This year is a great example – I have a pumpkin bed with a heap of fresh, new pumpkins where I thought it would be done two months ago, at the same time as I had five empty beds waiting to be planted out. None of that was in my plan! And to finish the month, I have random goat and meat shots. 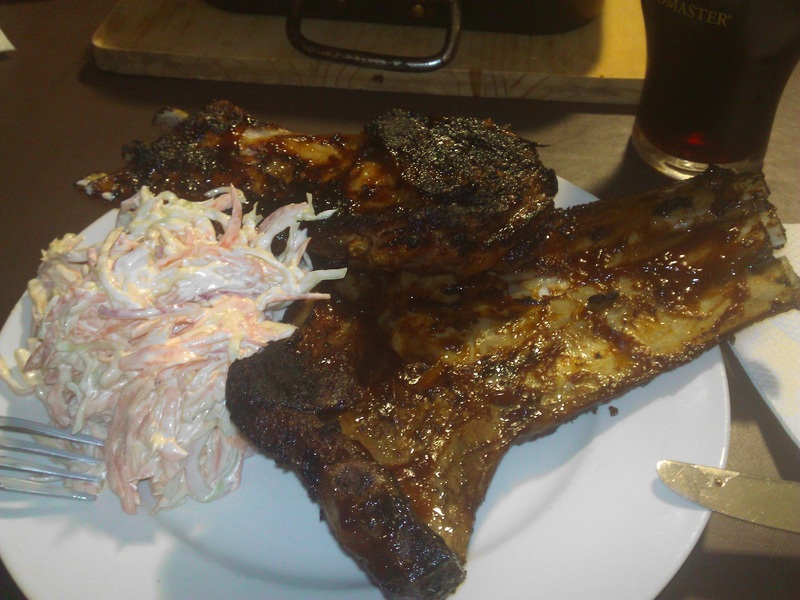 Home-grown, home-made pork and lamb ribs with home-grown and home-made ‘slaw. Out-freaking-standing!